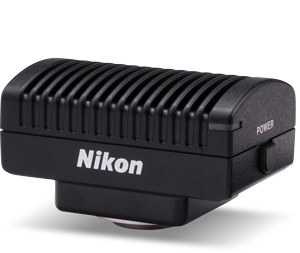 Nikon’s DS-Fi3 is a new high-definition color microscope camera equipped with a 5.9 megapixel CMOS image sensor. Its high-speed data readout, superior color reproduction and high quantum efficiency are optimal for imaging in various observations, such as brightfield, DIC, phase contrast and fluorescence observation. The DS-Fi3 has significantly higher quantum efficiency and lower readout noise than conventional models. It allows the capture of brighter images with higher S/N ratios in fluorescence observation. Due to the high-speed data readout by the CMOS image sensor and high-speed USB3.0 data transfer, the DS-Fi3 displays live images of full 2880 x 2048-pixel images at 15 fps, and 1440 x 1024-pixel images at 30 fps. This enables smooth display during focusing and the selection of observation locations. Nikon is well-known for outstanding and lifelike color reproduction, and developing superior algorithms for creating results that look like the actual samples. These algorithms are used in all of the color cameras in the Digital Sight lineup. The DS-Fi3 allows direct connection to a PC via a USB3.0 interface to control the camera and capture images using the imaging software NIS-Elements.